Cavechat.org • View topic - Caving Rescue Product Design Questions. Thanks guys. Caving Rescue Product Design Questions. Thanks guys. Caving Rescue Design Questions. Thanks guys. My name is Ning. I am industrial design MFA candidate. I am working on my final project which is enhance the operational safety and efficiency in caving rescue mission. I am wondering, if I can ask some question about caving, is there anybody can help me. Thanks guys so much. Right now I am in the research part. When I doing the research, I found the caving rescuers spend a lot of time in the part of search and transport victims. So I am thinking to design an automatics robot that can help rescuers to do the search job. It will save more time and generate more survival chance for victims. What do you think about my project? I have some storyboard want to show your guys. The first storyboard talk about the “Spider robot” used underground. The robot has Laser scanner that can scan the environment and computer to calculate the path. When the robot be sent into cave, it can scan the cave surface to find the minimum dimension of the cave, and figure out whether it can pass through. After a period of time, the robot detects the water, and it will make a decision how to pass through the water. The robot jump to the roof, and reverses position. In order to stand on the roof, the robot’s feet using the “Gecko feet adhesion” technology which can stick on the rock surface. Because the Laser scanner cannot scan through the object, so I am thinking, if there is a big rock dislodge from the roof and block the way, how does robot know if there is a victims behind the rock. Therefore, the spider robot may have other sensor to detect victims, like vibration sensor, heat sensor, or odor detection sensor. What is more, the robot can determines direction if it found the cave diverges into more tunnels. My name is Ning. I am industrial design MFA candidate from Academy of art university. I am working on my final project which is enhance the operational safety and efficiency in caving rescue mission. 2. Which part take a long time? 3. How do you guys deal with the lost in cave? How can you find orientation underground? 4. Do you think use the robot to search victims is good way? 5. Which robot do you think is better in cave, flying robot or on ground robot? Re: Caving Rescue Product Design Questions. Thanks guys. I'll take a stab at it. I can see a robot like this being very useful in mine rescues more than cave rescue, where you have more chance of running into bad air and extreme heat conditions. One concern I would have sending in a robot would be, if the cave was heavily decorated in formations. All parts of a cave rescue are important, including putting as little wear and tear on the cave as possible. "leave no trace". A lot of cave formations start by seeping water through cracks. A lot of this happens on ceilings. Having a robot jump up and grip the ceiling could be a bad thing, as far as breaking off formations. If the person is hurt, transporting a patient would take the most time . If not, search could take the longest. One of the first thing cavers do when they find a cave is map it. It is common to map as you explore, or leave flagging tape at intersections to help guide you back out. You then pick up all flagging as you leave. When cavers go caving, they usually go with someone who knows the cave or has a map of the cave. We also have a compass to help keep us oriented. 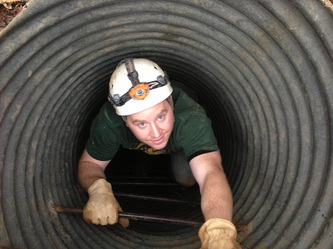 Most people that venture in and get lost are unprepared cavers we like to call "spelunkers". If a cave "rescue group" is called out to find them, then there is a rescue protocol that we follow. It's lengthy and I won't try and explain the whole thing to you, but, we start by gaining control of the cave entrance and assembling teams of people to search for the missing party. One person is put in charge (Incident Commander) of the operation and if it is a well known cave, cavers familiar with the cave will help lead the search teams. There is a very good possibility that someone on the rescue team will have a map of the cave. At the last NCRC training, people with smart phones took a picture of the cave map they were going in to, so they had a reference on their phone to follow. Got to love technology. It would be nice if the robot could both fly and crawl. You usually have to crawl before you get to the walking passage. Here are a few thoughts that would be useful to design into the robot. One would be communications. A big part of a rescue is getting voice communication between the "Incident Commander" and the patient or search team. There is a type of radio that does work underground without wires, but they are expensive to build and not readily available to the normal caver or rescue team. If your robot could both send and receive transmissions, then it could replace the hard wired phones we use along with the team it takes to lay the wire and man them. Being able to both talk to and visually see the person, from outside the cave, (Incident Commander position) when you find them would be huge. I would think that being able to pick up a heat signature of a person would be very helpful for your robot to search with. Maybe an infrared camera you could remotely monitor with. If the person was unconscious or hiding, this could really help in finding them. Hope this helps start the discussion. Re: Caving Rescue Design Questions. Thanks guys. I'm not familiar with the technology that would allow a robot to stick to a cave roof, but my sense is that it wouldn't work very well, mainly due to the non-uniform characteristics of passage roofs. My thinking is that it would be much simpler to make the robot watertight and have it float across any bodies of water it might encounter. trogman wrote: I'm not familiar with the technology that would allow a robot to stick to a cave roof, but my sense is that it wouldn't work very well, mainly due to the non-uniform characteristics of passage roofs. My thinking is that it would be much simpler to make the robot watertight and have it float across any bodies of water it might encounter. Thanks so much for your opinion. I also think about there are some vertical shaft in cave, so I develop my concept and storyboard. What do you think use swarm flying robot to detect the environment of cave? The drone using visible light communication system to contact with surface, and the transmission of lighting signal due to the limit distance of light transmission within 1-2 km. So I'm think about use 4 drones be a group, and there is 1 scanning drone and 3 semaphore drones. When they are out of the signal range, they will land a semaphore drone become a signal box, so the others can flying further. After the drone find the victims, people can interact with drone and tell it their situation. Thanks so much, it is really helpful . What do you think using swarm flying robot? they can work together, and I am thinking there are 4 flying robot be a group, 1 is a scanning and communication drone, and 3 of them are signal transmission drones.they are using visual light communication system to contact with surface. When they are out of range, the 1 of signal transmission drone land on the floor become a signal box that make the others flying further. I also think about using "Bluetooth low energy". Each of caver can wear a smart Bluetooth device. And when the flying robot near them, it can detect the victims and connect with them. it can through 3-5 km. What do you think? I think you are being too ambitious. Just making a non-flying machine that can travel through a majority of the types of passages found in caves would be a great accomplishment. There are many different kinds of obstacles in caves. For a flying machine, like a quadcopter, the challenge would be navigation without being in sight of a caver, Make a flying machine that can go down a passage, around a bend, past an intersection, and then find its way back. Not sure why you'd pick visible light over radio waves. You're limited to line of site which in most caves, if you have 4 total drones might get you 100' or so in. Again, my suggestions (and I'll bet Tim will do this since both subjects are of interest to him) is to move this to the cave rescue forum. I'd also recommend taking a 2 day OCR course in your area if you can, or better, the weeklong cave rescue course coming up in Colorado in May. Having a big interest in drones and robotics I would actually think that getting a flying machine through a cave would be far easier (and less wear and tear on the cave) than a land based robot. Here are two TED talks regarding quadcopters and the work done in making them autonomous and cooperative in an environment. Of course for now problems with battery life, size of electronics, and their weight are all obstacles to overcome, but hey, baby steps. I agree with Greg, communications would be the first thing to attempt. I could see a string of quads playing follow the leader, moving down passage from the entrance/main comm point. 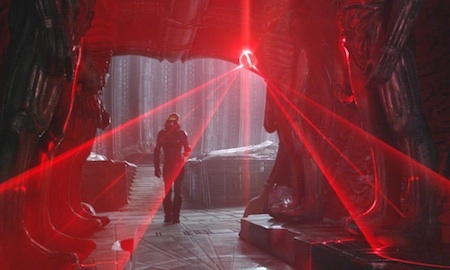 They would be equipped with a repeater and when a quad reached its maximum range to keep in contact with the main comm point (or its closest partner) it would stop and hover (or attach itself with gecko tape to a wall, saving battery) and repeat the signal down passage (or down a very deep pit). As you see in the video a kinect sensor is used to avoid obstacles and algorithms are used to keep formation. They really are amazing robots and I really don't see this being that far down the road. I would think a working prototype could be made now and be proven to work in say something like the Lost Creek Cave borehole or a maze cave like Rice Cave with a quad hovering above intersections proving the repeatability of the signal around many corners. Drones scare the begeezus out of me, but they also amaze me with all the possibilities. BTW, I love the drone encased in a Bucky Ball! Trogman, Gecko tape is a reusable adhesive that works like the foot pads of a gecko. It sticks to uneven surfaces easily, though it was developed to be used on sheer surfaces like glass and smooth concrete. Recently a female rock climber used pads of gecko tape to climb a multi story building with no pro. Pretty much millions of nano feet all bundled up into a bunch. Biomimicry at its best. I too am thinking communications would be a great tool and use of a robot. Being able to provide both audio and visual back to the surface would be huge. Instead of the idea of a string of repeaters, you should research how to transmit both audio and visual through the rock. I've seen audio done in a cave using a CB and either a ultra high or ultra low frequency repeater with it. I can't remember which one. It took quite an antenna to make it work. The person in the cave had to find a large enough area to set the antenna up in. You couldn't do it in a crawl or tight fissure. wangning198914 wrote: What do you think using swarm flying robot? they can work together, and I am thinking there are 4 flying robot be a group, 1 is a scanning and communication drone, and 3 of them are signal transmission drones.they are using visual light communication system to contact with surface. When they are out of range, the 1 of signal transmission drone land on the floor become a signal box that make the others flying further. I also think about using "Bluetooth low energy". Each of caver can wear a smart Bluetooth device. And when the flying robot near them, it can detect the victims and connect with them. it can through 3-5 km. What do you think? Hi Ning. Welcome to the forum. I think you have some promising ideas here. Bluetooth should be effective for very short range wireless communication in cave passages, and the use of light (preferably infrared so it doesn't distract the human rescuers) between robots is an interesting concept but could be affected by interference from a multitude of caver headlamps which use Pulse Width Modulated LED drivers. Also the average cave will require a lot more than just 4 robot repeaters if you intend to relay signals over any significant distance. Of the 3 choices in your initial post (search, treatment and transporting patients), my gut feeling is that the search process would most benefit from some type of automated robotic assistance. This seems to be your conclusion too. I think a compact, rugged, hybrid flying/crawling robot would be the most ideal solution but also the most complex and expensive. As for the most time-consuming part of an average cave rescue, I would say that would be patient transport unless the patient is minimally injured and able to move on their own. But with the various techniques we use I just don't think robotic assistance to treat or transport patients would be as effective as robots to help with the search process. For robots to be really useful in a cave rescue application, they should be able report back to humans on the surface in real-time (or short delay) even if they are programmed to operate autonomously. As Dan indicated, communication during a cave rescue is as challenging as it is critical. The default cave rescue communication method in North America is a modified army-type field phone system using wire, and its strength is in its relative simplicity and dependability. However trailing a long wire behind a robot all the way through a cave is not so practical (unless you design a robot to do exactly that and replace a human! ), so really wireless communication (radio frequency or your visual light concept) is the obvious solution for this. The old cave CB radio design with attached transverter (I think this is what Dan meant) converts 27MHz to 185kHz (VLF), and has been proven to work well in some caves through hundreds of meters of solid rock but is not always a perfectly reliable system. The transverter process is not very efficient, and the surface end is usually very susceptible to atmospheric and electrical interference. Going higher in frequency, the lower end HF band is less affected by atmospherics and allows for slightly more compact equipment, but is more fickle transmitting through different types of rock and different ground resistivity. Simple tone signals (like Morse) have more likelihood of being received through deep rock than voice communication, but even with good voice communication it would be a huge leap to the bandwidth required to support a data stream carrying video signals etc in VLF or even HF systems. Also this mode of communication requires larger equipment, batteries and antennas which would be difficult to make work on a practical cave-sized drone or robotic device. As an alternative to lower frequency RF, there are more compact and cost effective UHF systems. The good news is that while these signals generally do not penetrate rock to any practical extent, there has been some recent success experimenting with a series of UHF nodes positioned along cave passages where each 'hop' is line-of-sight. How about trialing a larger group of small robots (flying or crawling) autonomously deployed and able to be re-positioned throughout the cave to provide a series of nodes for passing voice, data and/or video either by light pulses or UHF? It would be rather equipment-intensive, but you could send a series of basic robots to spread out along main passages to act as mobile communication repeater nodes, while a few flying/crawling robots autonomously investigate for missing/injured persons and return back to the nodes to report. In a deep cave system you could even incorporate a wire carrying data from the surface to the search area, where an interface patches the signal through the wireless nodes/robots. And with a little extra instrumentation and miniature cameras and lighting, you could create a virtual map and video of the cave as you go! Let us know when you have prototypes ready to test, and we'd be happy to help you get them dirty. Wangning, how about a flying drone that can search injured and also do the 3D visual mapping? Thanks for all of your help. I got a lot of useful information. I'm working on research in this semester. And I will develop more practical concept and make prototype in next following semester. I would like to test them in future. According to your advice. I have developed 2 new concepts. 1. I will use "wireless ad hoc network" to solve communication problem. which use high frequency radio, and using some of robot being a repeater in main path. The swarm robot doing the search job. and back to each node to report the situation. In addition, what do you guys think if the robot can interact with victims and understand their gesture, then the robot can report the situation of victims to the surface. Also, my concept is a Crawling and flying robot. The ball shape framework not only can keep enough air through the propeller, but also can protect the propeller without broken by hit the rock. In addition, I am thinking the robot have 2 movement direction, that allow it to pass through the tight space. 2. The concept 2 is a crawling robot. Using ball shape will that can made robot do omni-directional freedom of movement. In addition, The robot climb the robot by using technology of "electroadhesion", it is similar with gecko skin. Also, the robot can float on the water to pass the underground river. Communication is a big problem. Basically, (anything over VHF) is only effective for a few feet beyond line of sight. In a cave with many turns you may require dozens, hundreds, or even thousands of repeater stations for high frequency communications. Cavers traditionally use HF or LF communications because they do not attenuate as quickly in solid rock. There are HF/LF radios that use ground conduction instead of a long antenna.